Next | Skip Next | Next 5 | Prev | Random | List Site Owner: Demos Ioannou | Want to Join? The Virtual InterNest: Best Site set up by any Finch-o-phile! Mooshhhh's Aviary - Now in the updated Finch Webring! 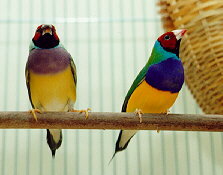 To your left is a picture of a pair of Gouldian finches. They are considered the most beautiful of all exotic finches. I recently got a pair of them and we'll see what happens. I have successfully bred Star finches; pictures were taken 8/17/98 and show the three Star hatchlings - born July 2, 1998. Just click here to see them as well as a great picture of a Star finch. The Star Finch (Neochmia ruficauda) is native to Australia, as are the Gouldians. I have been breeding Stars for a number of years. As a dedicated follower of the Mooshhhh Zone, you will undoubtedly be fascinated by this hobby. As a result, I have added the FINCH WEB RING that will give YOU, the browser, some additional insight into the avian subculture. I also raise Zebra finches and Bengalese (Society) finches. They share my aviaries with Bronze Winged Mannikins and a pair of Orange Cheeked Waxbills. To trade or purchase finches, contact me!